The SEO title (aka title tag) is a very important part of on-page SEO strategy. This is a ranking factor that can improve your overall SEO strategy quickly and easily. The title tag is an HTML element that specifies the title of a web page. SEO titles in WordPress (via the Yoast SEO plugin) generate the title tags for your web pages. In short, they are concise descriptions of your page content. Why are SEO Titles Important? Title tags (SEO titles) are displayed as clickable headlines in the search engine results pages (SERPs). The text of your SEO titles is found in traditional organic listings and featured snippets. Thus, SEO titles give you an excellent opportunity to control how your sites appears in the organic search results. The SEO title is often the first connection point with your audience. First impressions can have a powerful effect. Make them perfect. It is essential that you fill in the SEO title in WordPress for all of your pages. Strong SEO titles will improve both the performance and position of your rankings quickly. Social media channels like Facebook and Twitter also make use of title tags. So you can also control how your social media organic posts appear to your audience and influence clicks to your website. SEO titles are also important because they directly impact your organic search click-through rates (CTR). Relevant and interesting SEO titles help your website stand out in the clutter of organic search. You can steal traffic away from your competitors. Great SEO titles produce higher click-through rates. Achieving high click-through rates is crucial. Higher CTR rates satisfy RankBrain, a machine learning (AI) algorithm that Google uses to sort search results. All organic click-through rate data is analyzed by RankBrain. Higher click-through rates are considered positive signals and will help to boost your organic search rankings. 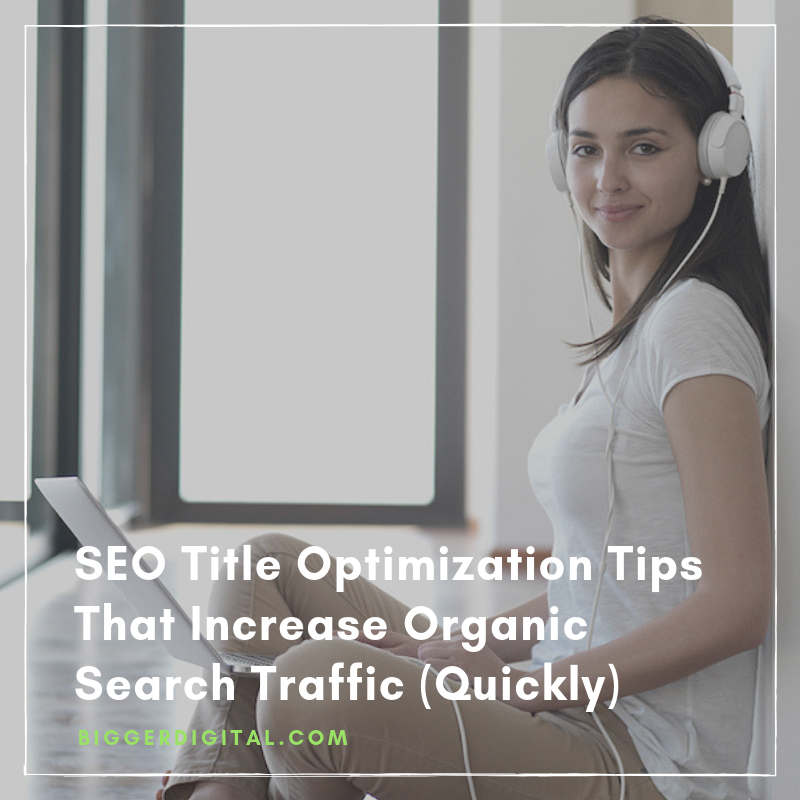 Improve SEO titles, increase your organic click-through rates, and jump from the bottom of a search results page to the top. What Is A Good SEO Title? It is important to understand how to write better SEO titles to generate clicks and traffic to your website. How Long Should Your SEO Title Be? There is definitely a sweet spot. Too short is limiting. SEO titles that are too long (over 75 characters) will get cut off in the search results. The ideal SEO title length is about 60-70 characters. What Is The Best SEO Title Structure? I like to make sure that my focus keyword (the main topic) is in the first half of the SEO title. Right away if possible. Below, I show the SEO title and meta description that I used for this article. Here are a few more examples of SEO titles (title tags) that could be tested against what I have first chosen. Each of the above title tags would perform very differently. Small changes in word usage or order can have dramatic impacts on performance. How do you know what will work best? You don’t. Thus, you must test and experiment. Measure the results using Google Analytics. Optimize for higher CTR and better performance. Improve positioning and increase organic search traffic. Where Is The SEO Title In WordPress? In WordPress, your article headline generates the SEO title automatically. However, the default WordPress themes don’t provide a way to enter or edit custom SEO titles. I like to customize my SEO titles for each page on my websites. Install and set up the Yoast SEO plugin to gain maximum control. Or, buy a premium WordPress theme (I use and recommend Studiopress themes) that includes fields to enter (and edit) the SEO title and meta description of your pages. Let’s explore editing SEO titles using the Yoast SEO plugin. How Do You Edit An SEO Title With Yoast SEO? On any page or post scroll down to the bottom and look at the Snippet Preview section. Click edit snippet. Now you can enter a customized SEO title and SEO description for your page. Let’s take a look at an SEO title example. This is the snippet preview for this WordPress post. 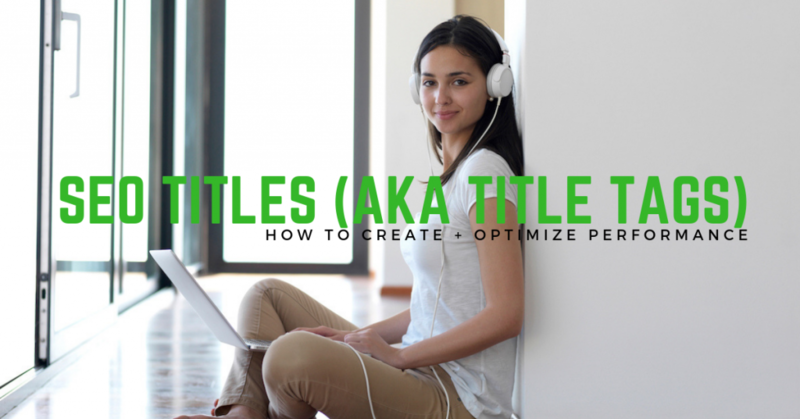 What Is Title Tag Optimization In SEO? Title tag optimization is the process of testing and analyzing how SEO title (and meta description) copy influence organic search click-through rates. Google Search Console (GSC) provides the data and reports that you need. Let’s run through an example of how to optimize your CTR. I have connected my GSC account to my Google Analytics reports. That is where I do my research and analysis. But you could also do this in your GSC reports. Navigate to Acquisition -> Search Console -> Landing Pages. Look at each landing page for your site. Specifically, isolate pages that have lower CTR. In this example you can see there is quite a range for my top 5 pages. Number 3 in particular stands out. This page is getting a large number of impressions but a rather low number of clicks. It has a very low CTR at 0.57% considering the average position. There must be something wrong with the SEO title and possibly the meta description too. Combined they are not generating a very good CTR. Investigate. Go to the page in question. Then look at your pages that are getting high CTR. Why are they performing better? Can you identify what is working and what is not? Modify your SEO title and meta description to increase page CTR. That is exactly what I did for the page in question. Look at the positive results below. A noticeable change in CTR after August 22nd. Before CTR was pretty flat other than one day. After August 22nd, CTR is fluctuating and generally higher for most days. The average click-through rate increased by 60% compared to the 25 days before the change was made. 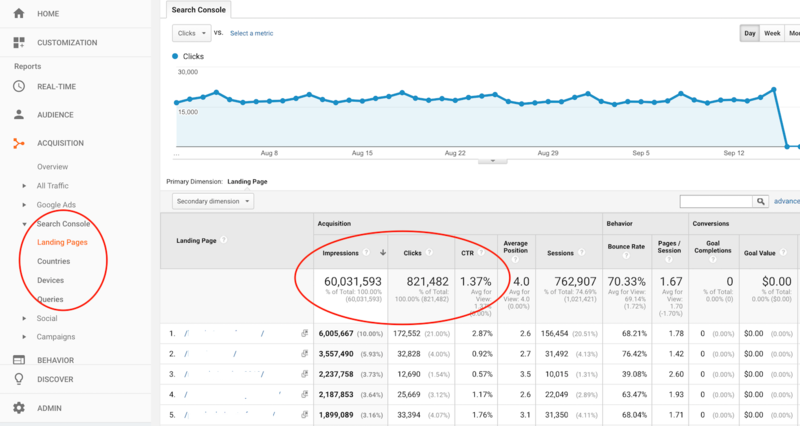 The higher CTR increased sessions (visits) by 16%. That is a fantastic bump in traffic that can now be monetized. Simple changes in words and language can boost performance in a big way! If you can demonstrate a long term increase in page CTR (and dwell time) your average position should improve. You will rank higher. This in turn will continue to increase the page CTR. Higher rankings get better CTR. A snowball effect. Perfect. How Can You Optimize Your SEO Title? Take a look at the keywords that are driving the organic impressions. Are the main (focus) keywords in your current SEO title? Are any other relevant keywords missing? Try to understand the intent of the keyword searches triggering impressions. Is your SEO title aligning with the specific search intent? Are you missing a key theme or angle to the main topic? Take a look at your competitors. Especially competitors that are getting indexed for featured snippets or ranked above you. Are they doing anything that might be working that you could modify or do better? Look at your SEO title in the search results. Is it compelling? Most new clients that I take on and work with have missing or poorly written SEO titles in their content. This is a missed opportunity that negatively impacts their entire SEO strategy. I look at these two ranking factors first when I conduct and SEO audit of client sites. Writing unique, compelling, well thought out SEO titles and meta descriptions can be the difference between getting some organic search traffic or getting none. Do the work! 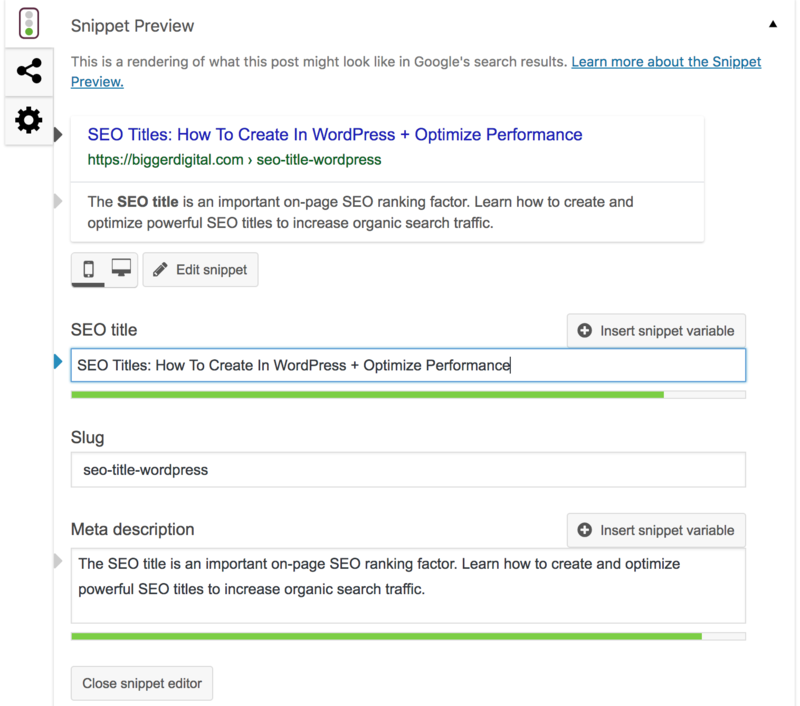 Fill in your Yoast SEO snippet preview for every page. This is a great starting point for effective WordPress SEO and a key element of my SEO checklist. Do you like learning about SEO? Check out my Power SEO course that is written in an easy to understand instruction format. I cover only what you need to know, what works, and gets results. If you do not have the resources or time contact me. I can help your company achieve big improvements in SEO implementation.